‘Ai Ma Ra’ is a monumental album containing over 105 minutes of experimental elemental and ambient music, original in the literal sense of the word. More than music, it is ‘ethnography of the unknown’ in action, providing vistas into rarely glimpsed corners of reality. Created primarily on acoustic instruments, organs and harmonium, carefully mastered on vintage tape, the sound is equally earthy as it is otherworldly – a contradiction in terms maybe, but then ‘Ai Ma Ra’ is not classified easily in any other respect either. It is a record in which to immerse one’s self over time, containing more than two years’ worth of strange experiences and sensations distilled into a curious, potent elixir, the use of which may in its truest sense be determined only by the individual listener. 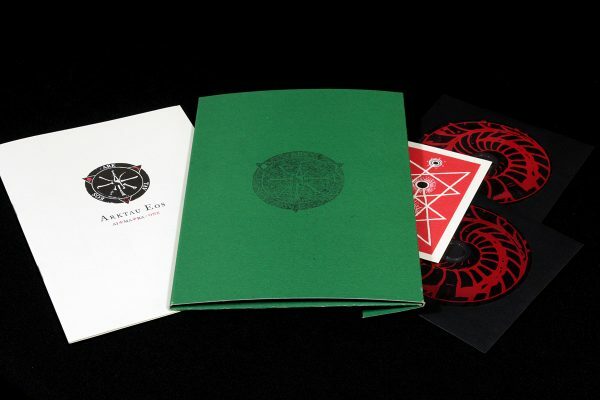 ‘Ai Ma Ra’, pressed in 1.000 copies, comes in a sturdy, deep green cardboard box stamped with the mark of Arktau Eos. Contained within is an 8-page booklet bound in tête-bêche format on high quality paper, a small talismanic print, and two CDs.